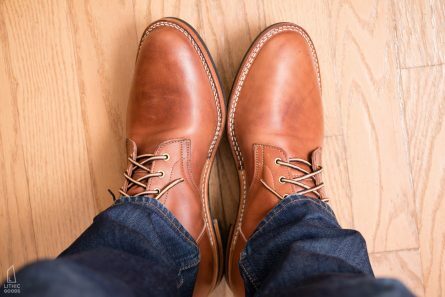 Allen Edmonds Higgins Boot in Natural (size 13). USA. $350. Purchase. The Allen Edmonds Higgins Boot fits true to size, but it’s a looser fit than the Allen Edmonds Strand, which in 13D fits my foot perfectly; this is likely because as a boot they allow for a thicker winter sock. 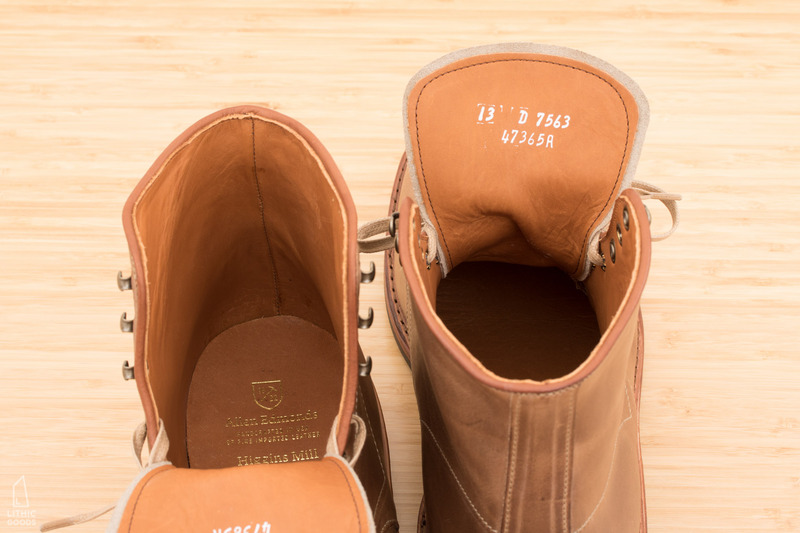 The upper on this boot is the ‘Natural’ color, which I quite like and appears as expected. 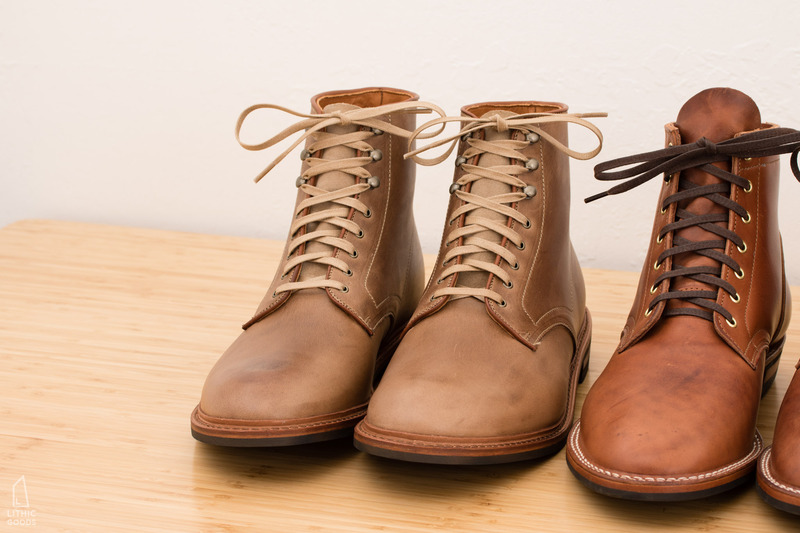 Unfortunately this pair arrived with quite a blemish on the right boot’s toe. I’m fairly forgiving when it comes to leather “character” defects, but this is pretty bad. For example the left boot has some small scrapes and a bit of color variation and spots, but that’s to be expected and it would disappear with use. The toe spot I wasn’t convinced would ever go away, mostly because it was three dimensional and appears to have been caused by some kind of compression on the toe. 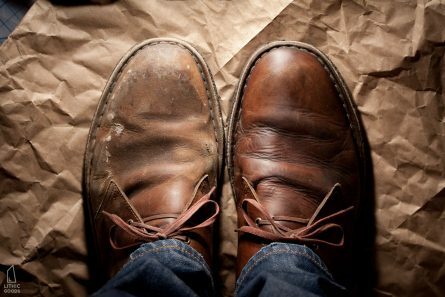 My amateur guess would be it occurred while applying the sole or when the last was removed. 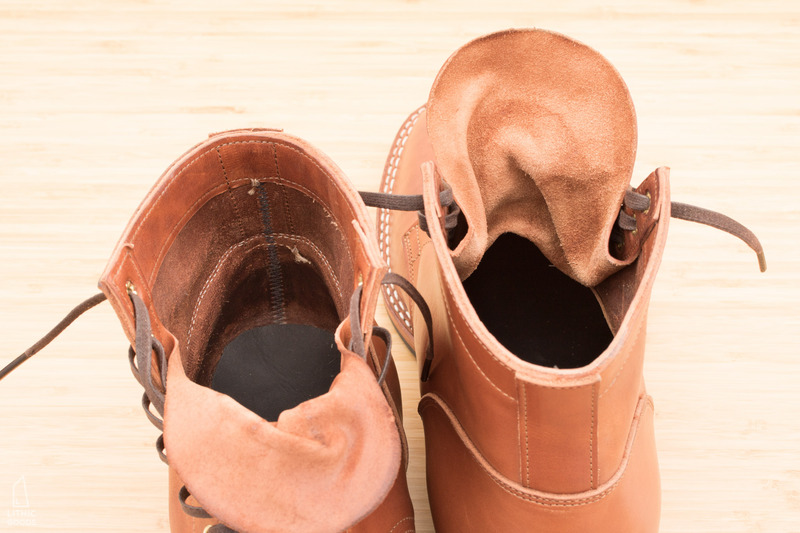 The left boot also has a very minor spot like this, but it’s small enough to be of no concern. One other negative is the suede tongue. For a “rugged” boot like this (not really that rugged, but more casual than a dress boot), I prefer a gusseted tongue made of thin supple leather. This is comfortable, functional, and my aesthetic preference; it keeps snow and rain out and doesn’t fall to one side or another. The tongue could also be a bit longer. 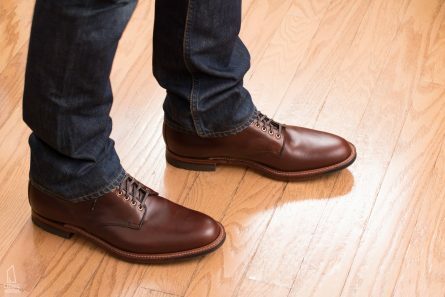 The Alden’s tongue is just a few mm longer and I think it provides a superior aesthetic. 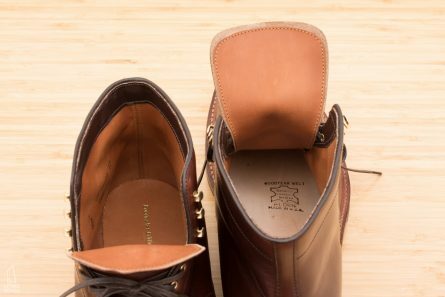 The interior of this boot is lined, which is unexpected for a boot at this price range, and really makes this boot a good deal. 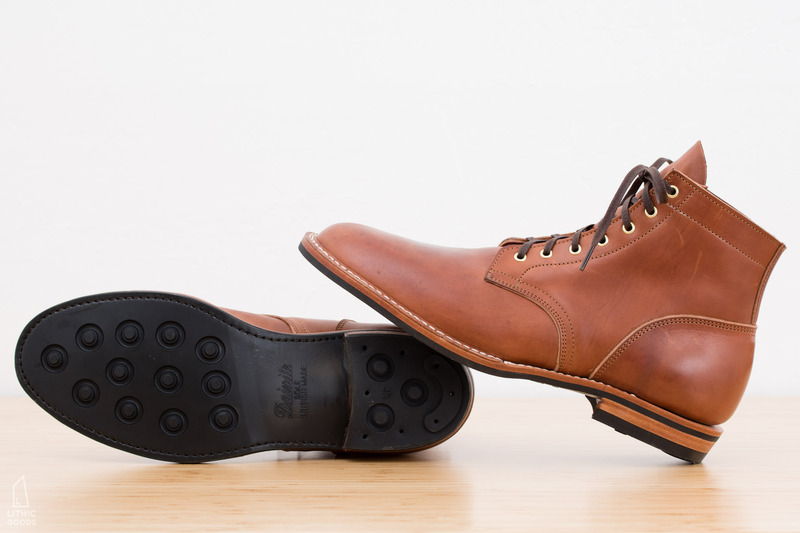 A full 360 degree goodyear welt finished with a Dainite sole and a block heel is a very clean and attractive look. It’s also very comfortable. 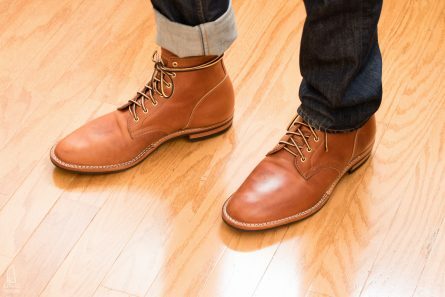 My AE Strand’s are super comfortable and this footbed feels the same, which is to say, way better than my Red Wing Iron Ranger. 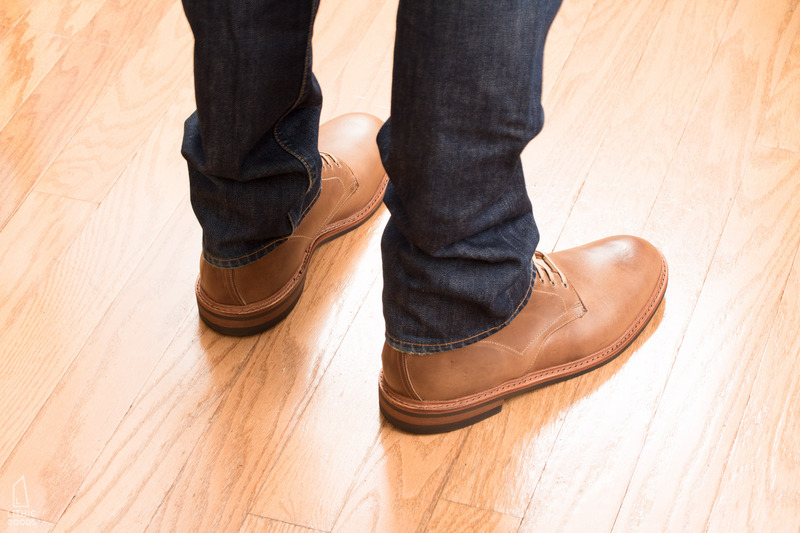 My big surprise with the Dainite sole is how slippery is it on wet wood or metal. It’s like a slip and slide. Given that there are rubbers that don’t slip on man hole covers and metal grates, I would have thought for such a popular sole they would have used a non-slip rubber. 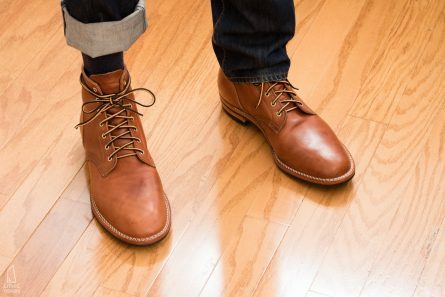 $300-350 (mine were on sale for $300) for a fully lined, well crafted, comfortable goodyear boot made in the USA is a steal. 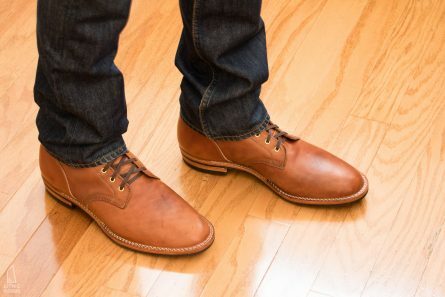 I’d definitely recommend these over the Red Wing Iron Ranger, since both soles are in my opinion sub par. If you want them in Natural (also offered in brown), I recommend buying them in person so you can handle the toe blemish QC inspection yourself. Allen Edmonds has terrific customer service. 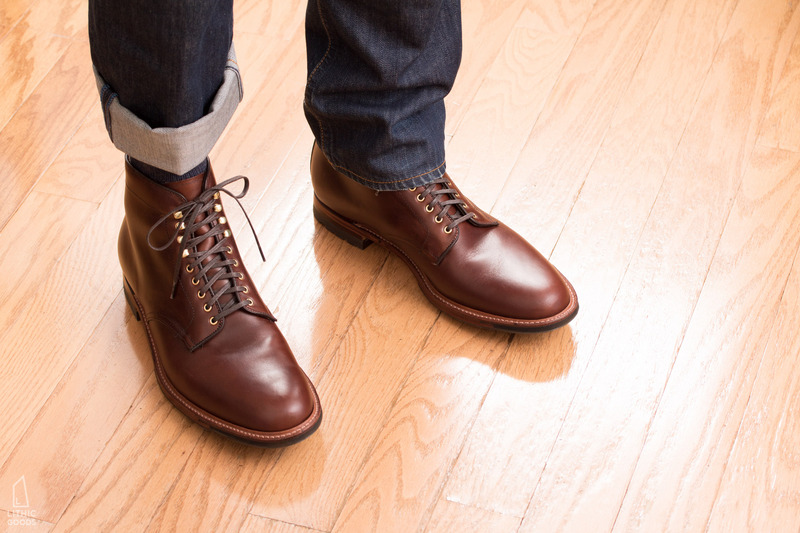 Truman Boot Co Service Boot in Marrone Pull-Up (size 13). USA. $530. Purchase. 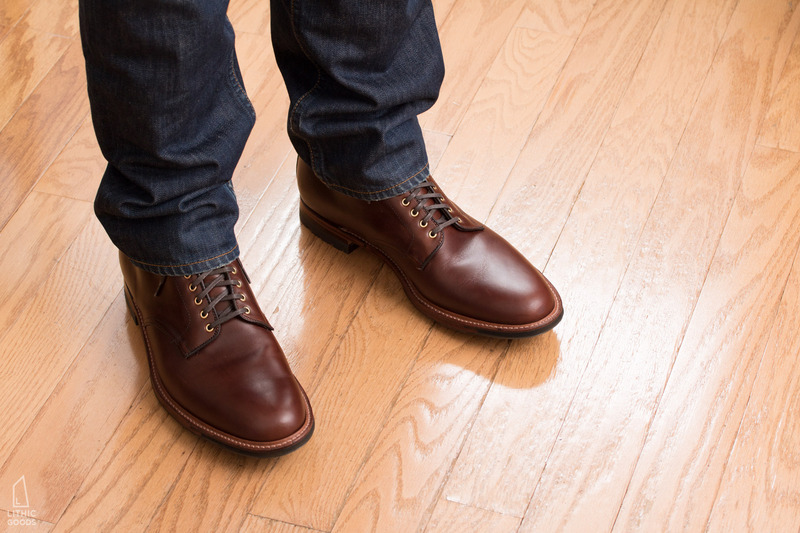 The Truman Service Boots fit true to size and, like the Allen Edmonds Higgins, they’re roomier than a dress shoe. Again I believe this is to accommodate warm winter socks. 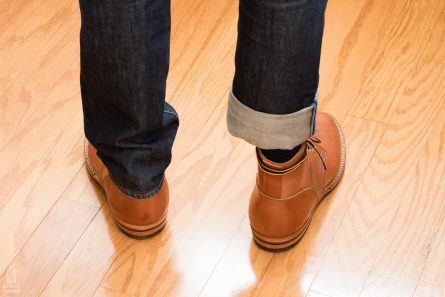 I typically wear them with mid-weight smart wool phd socks, which provides a perfect fit for a boot you can walk in all day. The vegetable tanned Marrone horse rump pull up leather is among the best I’ve ever seen, with great depth and variation. In the photos you can see that the left and right boots don’t match perfectly (the left boot is slightly darker), but after taking the initial photos I conditioned them with a little coconut oil on the vamps and they darkened and then lightened back up to nearly identical; the right boot’s leather was just a touch less conditioned. This also eliminated the slight grid/dot pattern from the right boot. The color is even better in person than in the photos. 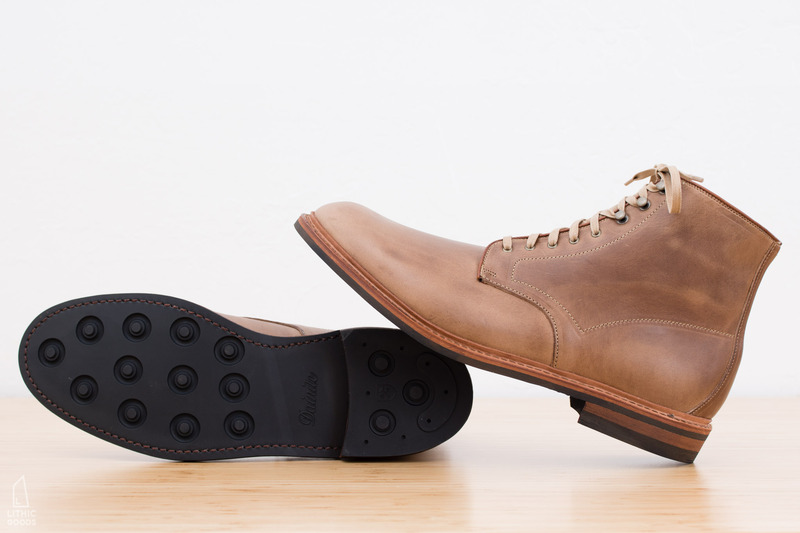 The tongue is made of thin, supple leather as I prefer and is gusseted for weather protection. The toes are unstructured, so there isn’t any extra material (celastic) providing support for the toe shape, which means over time it collapses a bit around your foot. I’ve never had a boot like this and so far I really like it. 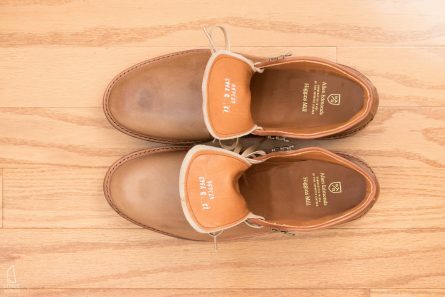 Combined with the shape of the last it creates more of a dress shoe style toe, but through wear will show your foots shape a bit. 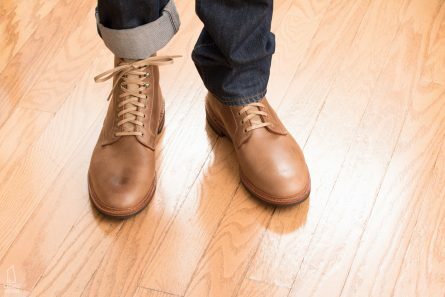 There are no speed hooks, but with the long leather laces I never need to rethread them, and they work and look great with a full wrap at the top (as seen in the photos). These boots are lined in the vamp only. 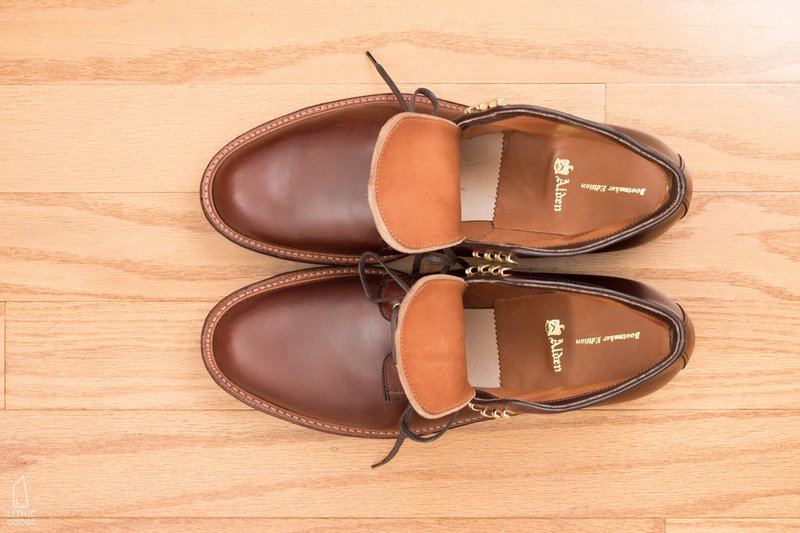 Unlike the goodyear welts used by Allen Edmonds and Alden, Truman uses a stitch-down welt, which is similarly weather resistant, but results in a slightly different style, with the vamp flaring out and being stitched to the sole with a second row of stitches. Truman also has a very slight forward cut on the heel that I hadn’t noticed until I received them in person, but I think it’s a great example of their attention to detail. 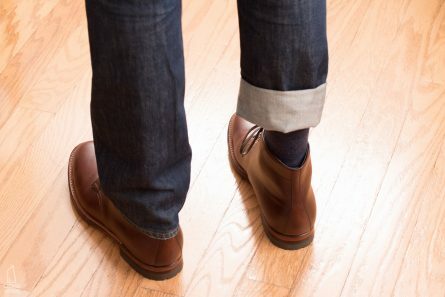 It’s very subtle and does a good job of reducing the clunkiness of a block heel, without going full western/PNW. The Truman’s are damn near perfect for what I want out of a pair of boots: beautiful leather with character, comfortable for long walks (12+ miles) in all types of weather, capable of being dressed up or down (they come with rawhide and waxed laces as shown in the photos), fully customizable (sole, cap-toe, eyelet material, speed hooks, heel tab, etc), and made in the USA. Note: these boots were provided for review and I have provided my honest opinion. Alden Plain Toe 5-Eyelet Boot in Brown Chromexcel (size 12). USA. $595. Purchase. I sized down to a 12D for these and they were snug, but still very comfortable. 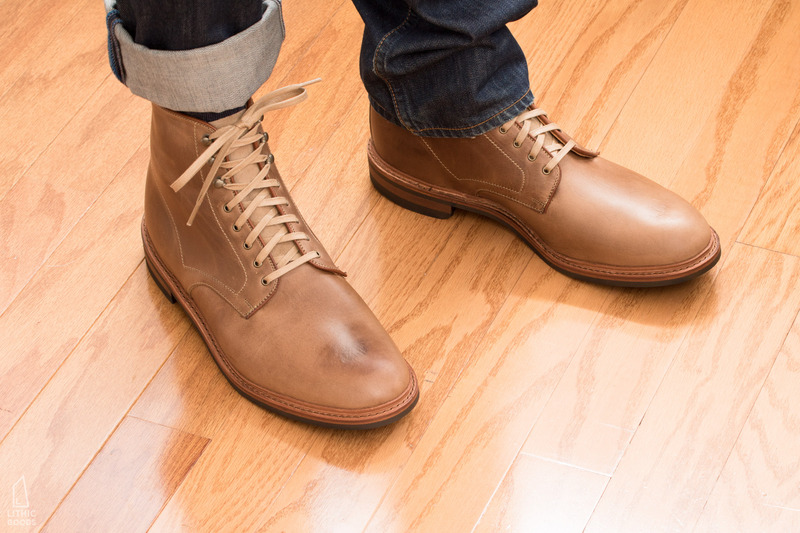 Made on the Barrie last, these fit similarly to an Indy Boot, but without the toe stitching. 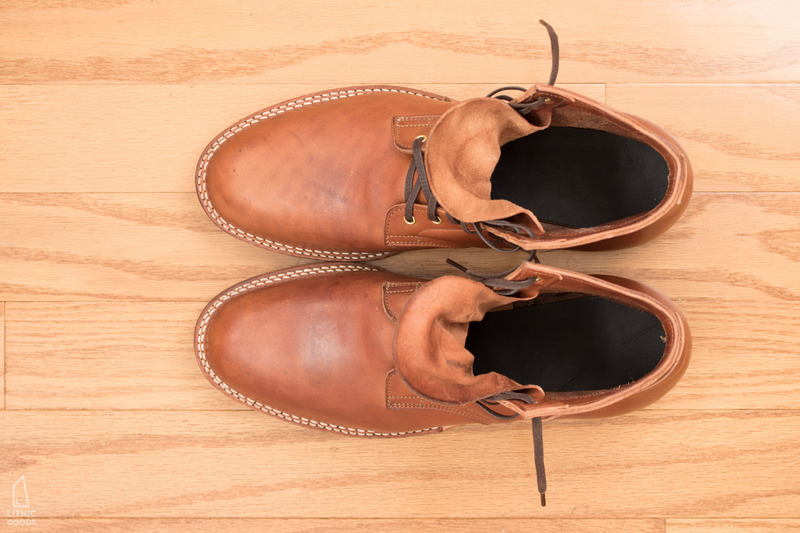 They have a bit more refinement than the other boots with more eyelets/speedhooks and no contrast stitching. 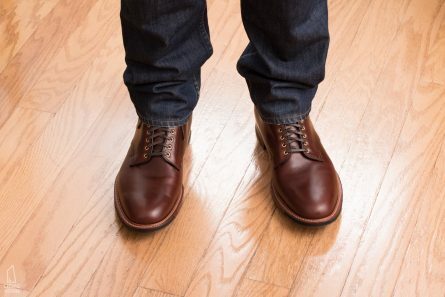 The brown chromexcel on these Alden’s was quite a bit darker and redder than I was expecting and lacks the character of Truman’s pull-up leather, but it’s still good, just more of a uniform dying. It almost felt like it had been applied as a coating, rather than a dye. One of the speed hooks was also crushed all the way closed, so I had to open it with my leatherman and another eyelet (outside top eyelet of the right boot) was punched in a bit low and close to the previous speed hook, so it doesn’t quite line up with the speed hook across from it. These are minor cosmetic issues that probably wouldn’t bother most people, but I like perfect products, so I feel compelled to point it out. These boots are fully lined and supremely comfortable. Goodyear welt with a commando sole is a great combination. The lugs are shallow so, similar to the dainite sole, they’re not going to provide great traction in snow, but the rest of the time they’re great. 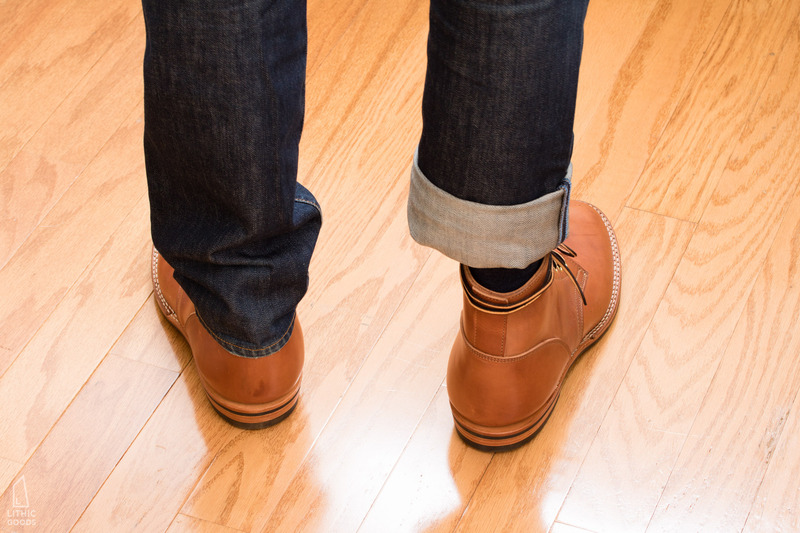 As seen in the ‘top view’ photo below the goodyear welt stitching on the left toe becomes very tight. Again, this isn’t a big deal, but it isn’t perfect. The Alden Plain Toe Boot on Barrie last is a timeless creation, but be aware of how dark ‘brown chromexcel’ can be. It’s probably best to buy this shoe in person for fit and finish. Hi Jon, thanks for putting all of this info on boots together, I’ve enjoyed working my way through it. However if you could have only one, which one? 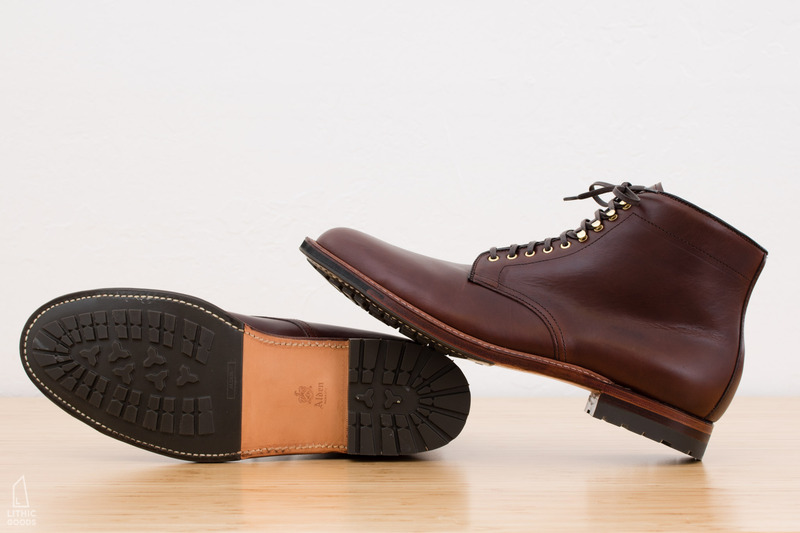 You seem very keen on the Truman Boot if you have $500+ to spend. 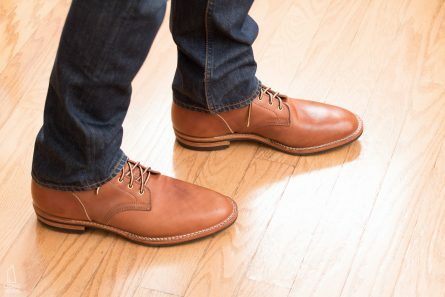 Is the Allen Edmonds at $350 in runner up? Hi Andy, thanks for the comment. As mentioned above the Truman boots come closer to my ideal, but the Allen Edmonds are also a good boot. My main recommendation is to go buy it in person. 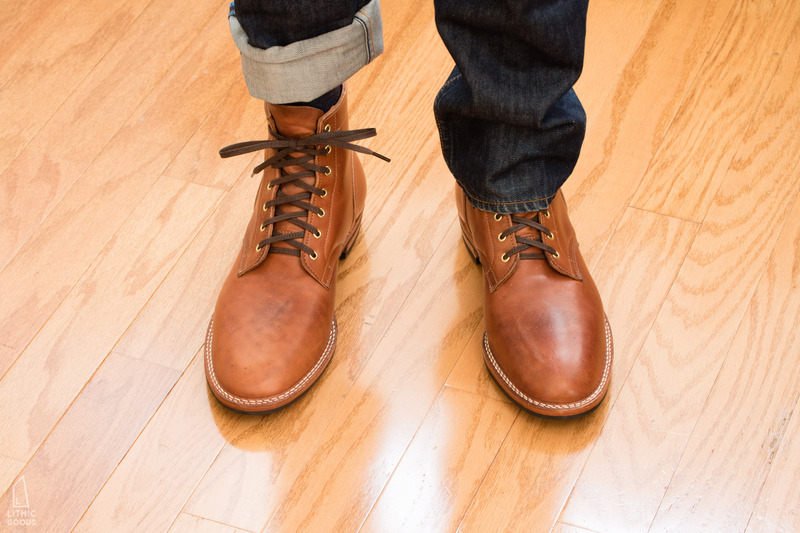 There are AE stores in most major US cities and this will ensure you get a boot that’s up to your standards. 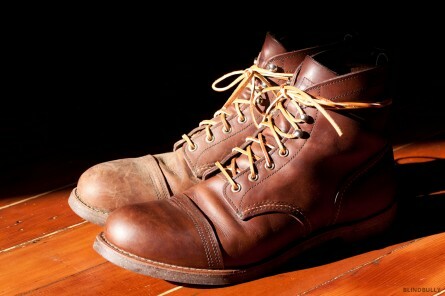 Large blemishes on plain toe boots are too noticeable for me to ignore, but that’s not a concern if you buy in person. Good luck! 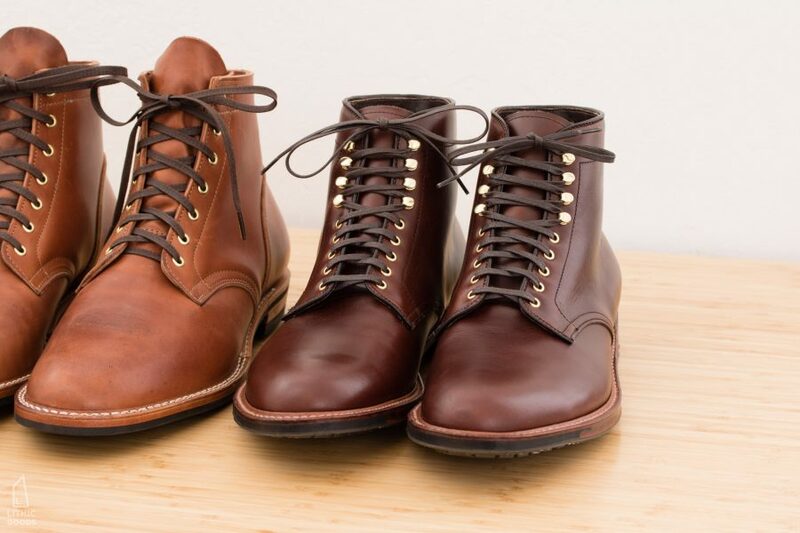 I was looking for a very nice pair of boots to purchase online and by chance I happened to stumble on your website. I’m very impressed with your attention to detail when reviewing boots. You clearly have a love for things that are made well. 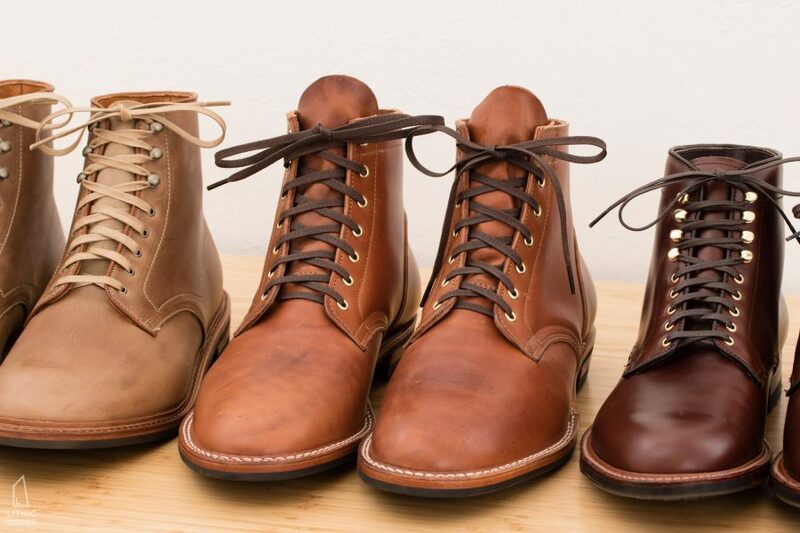 Therefore, I must ask, what is your favorite boot? Recently, I’ve been looking at Truman Boot Co and Allen Edmunds. 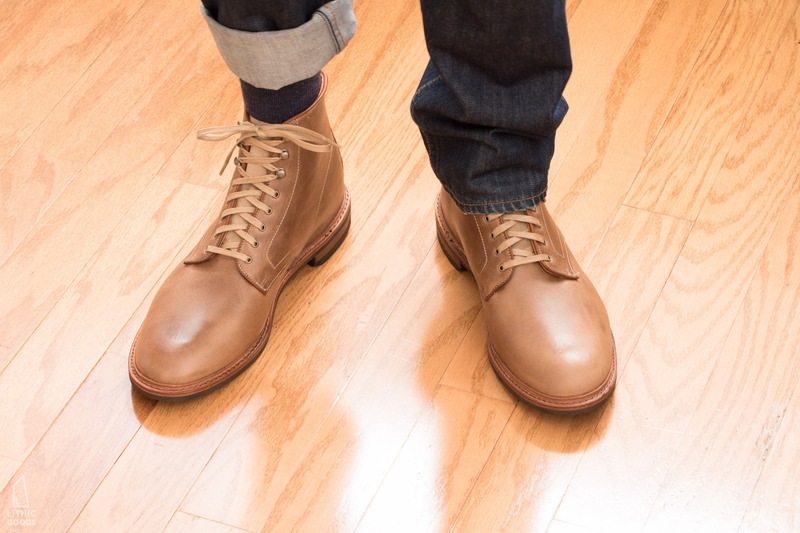 I’ve been leaning towards the Truman Boot Co since you thought of them very highly and I do like their styles. 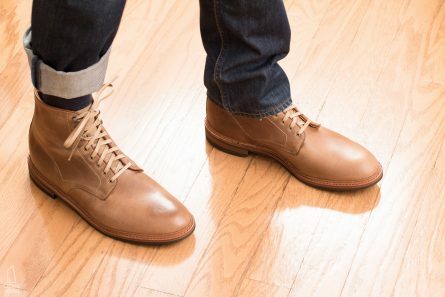 I want a boot that is comfortable, unique, and will last a long time. Any suggestions and thoughts would be greatly appreciated, thanks! I just found your write up and I’m really impressed. You’ve done your homework and given me great direction for my next purchase. 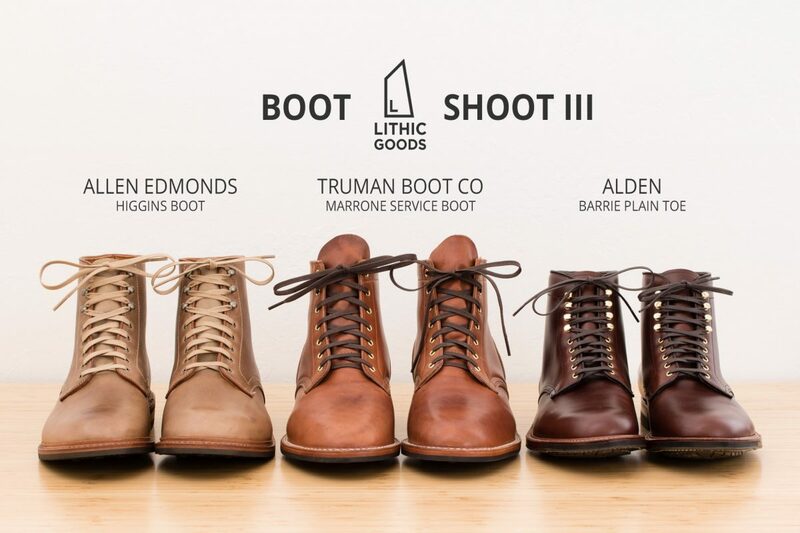 If you do consider a Boots IV British boots are ripe for review. Trickers, Church’s, Loake and Cheaney all make fine products.